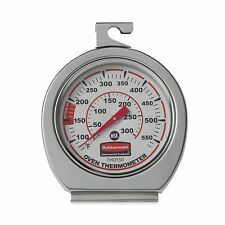 TruTemp, 2 1/4' Oven Thermometer, NSF Certified, Stainless Steel, Hangs Or Stands, 100 Degrees To 600 Degrees Temperature Range, Fahrenheit & Celsius Scales. Cooking candy or deep frying foods to the perfect temperature is easy with the TruTemp thermometer from Taylor. This instant read thermometer has an easy to read 2 dial and optimum temperatures for candy making printed right on the face of the dial. 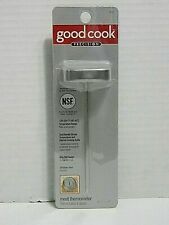 It also features a shatter proof plastic lens and stainless steel adjustable pan clip. Most ovens, especially old ones, run hotter or colder than their set temperatures indicate. 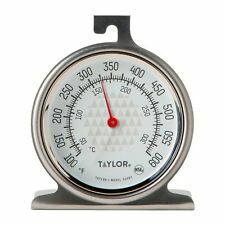 Rather than guessing how much to raise or lower the heat for a particular recipe, bake and roast with precision using a highly accurate oven thermometer like the Taylor Oven Guide. Made from durable, heavy duty stainless steel, this mercury free thermometer measures temperatures from 100 to 600 degrees Fahrenheit. The large, easy to read face also provides a heating zone guide. Dishwasher safe, this thermometer can hang in the oven or stand alone. It's NSF listed for food hygiene and safety. This multipurpose thermometer takes the guesswork out of cooking meats and poultry and starting yeast for breads and other baked goods. 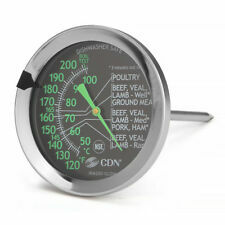 Its 3-inch face measures temperatures from 105 to 185 degrees F. The face displays a guide for proper meat, poultry, and yeast temperatures. 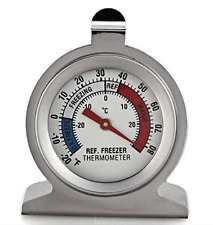 The thermometer is made of stainless steel, has a 3-1/2-inch stem, and is dishwasher-safe. Optimum warming, baking and roasting temperature zones are indicated in red on the dial, for fast at-a-glance readings. Constructed of tough, stainless steel to resist rust and corrosion. Constructed of tough, stainless steel. This high temperature thermometer takes the guesswork out of deep frying chicken, doughnuts, and french fries or making jelly, fudge, or butterscotch. Its easy to read 8 inch face measures temperatures from 100 to 400 degrees F. The face shows proper candy making temperatures, from thread to hard crack. An adjustable clip on the insulated handle secures the thermometer to a pan. Made of stainless steel with a shatterproof plastic lens, the thermometer measures 12 inches long overall and is dishwasher safe. Lot of (2). User Review Item Condition NSF listed. Accurate from 130F to 190F Durable stainless 4.5" stem. Whether your making candy, jelly, or deep frying you will love this candy thermometer from Norpro! 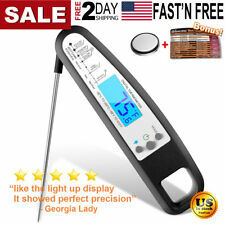 With a five-inch probe and 2.5-inch easy to read dial this stainless-steel thermometer includes an adjustable clip making it easy to attach it to the side of a pan. Hand wash recommended. Made in China. 10-year limited warranty. It's more than accurate, it's AcuRite. Oil & Candy Temperature Guide on the dial. Fahrenheit temperature scale. · All International Sales are final, as is whereas.